Even though the concept could easily be demonstrated to be viable mathematically, single sideband operation was early on widely regarded as an unrealizable laboratory curiosity, especially with a suppressed carrier. More circuitry is of course needed to accomplish single sideband communications both on the transmit and receive sides, but other than stricter stabilities and precision for frequency sources, single sideband operation is easily obtainable. There still remains a debate over whether voice quality is as good versus double sideband, but the is no arguing whether the spectral efficiency gained with single sideband is a great benefit to the world. My first experience with single sideband, suppressed carrier operation was while designing a modem for the Inmarsat base station installation. At the time, there were no ICs available to do the job, so individual components were used for the mixers, oscillators, and quadrature power splitters/combiners. A potentiometer was used on the I channel (in-phase) to null out the carrier. Nowadays, a single IC does the entire job, including often with an integrated filter, level adjustment, nulling circuit, and A/D or D/A converter. We've come a long way, baby. According to many remarks heard on the amateur bands, single sideband (s.s.b.) is a mysterious bunch of gibberish that defies clear reception and causes an unwarranted amount of QRM. It is human nature to dislike anything not clearly understood. A problem not readily understood sometimes may be prepared for easy mental digestion by comparison. It is the purpose of this article to present a comparison of a s.s.b. 'phone signal and an a.m. double-sideband-with-carrier 'phone signal, and to describe two methods of s.s.b. reception. Let us first consider the conventional a.m. signal, consisting of a carrier wave and two sidebands, one on either side of the carrier frequency. We will choose a carrier frequency of 1 Mc. and a conventional plate-modulated amplifier for our consideration. We connect a 1-kc. sine wave audio voltage to the input of our speech amplifier. At the output terminals of the modulated stage, there will appear three r.f. 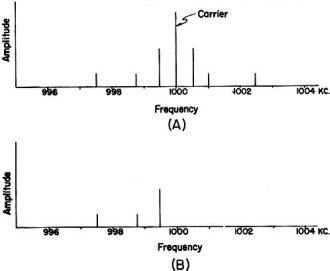 frequencies: 1000 kc., which is the carrier frequency; 999 kc., the lower sideband; and 1001 kc., the upper sideband. This is shown in Fig. 1. Fig. 1 - The spectrum of a 1-Mc. carrier modulated by a 1000-cycle signal. Fig. 2 - The spectrum of a 1-Mc. carrier modulated by a 1000-cycle signal, with the carrier removed. Since the only part of an a.m. signal that does not vary in frequency is the carrier, it becomes readily apparent that the carrier could be replaced at the receiving end. 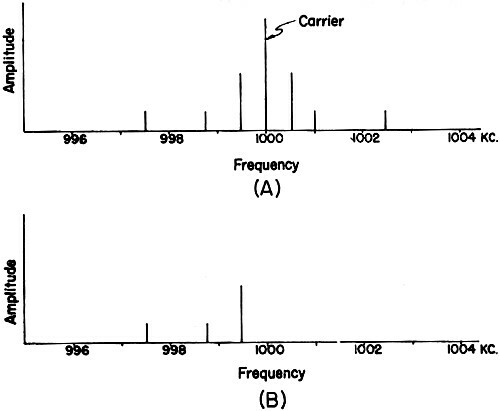 Only a small fraction of a watt of carrier is required at the receiver, even on the strongest signal; whereas, to transmit the carrier sometimes requires as much as 1.5 kw. transformer primary power in an amateur transmitter. Only one sideband need be transmitted to produce the original audio frequencies at the detector output, so we can eliminate one or the other of the sidebands. The transmitted signal (or sideband) will then become simply a carrier (single tone sine wave audio input) that differs from the original carrier frequency by the frequency of the audio tone. (See Fig. 3.) A panoramic picture of a double-sideband signal with carrier and transmitting voice might appear as in Fig. 4A at some instant. An s.s.b. signal would appear as in Fig. 4B. The pips or "grass" appearing on the base line of the panoramic pictures in Fig. 4 correspond to the individual frequencies comprising a rather complex voice wave, with components at 500, 1250 and 2500 cycles. All intentional transmission of radio frequency energy is done for the purpose of conveying thoughts from one place to another. C.w. has enjoyed the No.1 spot down through the years as the most efficient method of transmission. This efficiency is obtainable at the receiving end because the unmodulated c.w. signal has no width; consequently, the selectivity of receivers can be increased many times beyond the bandwidth required for 'phone transmissions. The increased selectivity provides a much higher signal-to-noise ratio at the receiver. The number of c.w. signals that may appear in a given frequency spectrum without mutual interference is limited only by receiver selectivity, stability, and effects of keying. Unfortunately, this is not the case with 'phone signals. In the case of 'phone, the limiting factor is the width of the sidebands produced by modulation. Fig. 3 - The spectrum of a 1-Mc. carrier modulated by a 1000-cycle signal, with the carrier and one sideband removed. It is generally agreed that an audio bandwidth of 3000 cycles will allow sufficient fidelity of reproduction for transmission of the human voice. Any reduction below this figure will tend to reduce the intelligibility of the voice reproduction through removal of the overtones and sibilant sounds. It would seem, then, that the minimum bandwidth obtainable with d.s.b. transmission is 6 kc. Referring to Fig. 4B, we find that only one sideband is required to reproduce the original audio at the detector terminals in the receiver; so actually the additional sideband may be termed as excess baggage. It is not needed to reproduce the original modulation at the receiver. Further, comparing Figs. 4A and 4B, we find that by removing the unwanted sideband we cut the bandwidth in half. It appears rather obvious that this one stroke will permit twice as many stations to occupy a given spectrum. It will effectively double the width of our 'phone hand! Upon further study of the chart, it would appear that we can improve the over-all efficiency of our transmitters by eliminating the carrier wave. Since the only intelligence-bearing energy transmitted is in the sidebands, the carrier does not contribute one bit at the transmitter end so far as intelligence is concerned. It has served its purpose of converting the voice modulating frequencies to radio frequencies; there its usefulness ends. From there on the carrier is excess baggage. So far as the detector in the receiver is concerned, it isn't particular as to the source of the carrier. It can just as well be furnished from an oscillator at the receiving end. If we have succeeded in presenting the thoughts clearly to the reader up to this point, it will have become apparent that essentially, the s.s.b. signal is the same as the conventional a.m. signal, with the carrier and one sideband removed. Therefore, the only thing that needs to be done in order to restore the original intelligence is to replace the carrier on the signal before it reaches the audio detector in the receiver. In a superheterodyne receiver, the carrier may be replaced by injecting the carrier from all oscillator at the i.f. frequency into the. i.f. section of the receiver, or by injecting the carrier from an oscillator at the signal frequency at the antenna terminals of the receiver. If carrier injection from the b.f.o. in the receiver is used, the receiver should be adjusted as follows: First, with the receiver set up in the regular a.m. position, tune the bandspread dial for maximum deflection of the S-meter from the s.s.b. signal. Do not touch the bandspread dial after this. Next, reduce the r.f. gain to zero and increase the audio gain to maximum. Bring up the r.f. gain until the signal is heard at a comfortable level; then turn on the b.f.o. and carefully adjust the frequency of the b.f.o. until the voice sounds natural. If this procedure is followed closely, little difficulty should be experienced tuning the signal, regardless of which sideband is being transmitted. In using the b.f.o. method of carrier insertion, it should be pointed out that practical reception of s.s.b. signals depend upon the stability of the h.f. oscillator in the front end of the receiver, as well as the stability of the beat oscillator that supplies the carrier. Any frequency change in the h.f. oscillator produces the same effect as changing the frequency of the transmitter on the other end. The h.f. oscillator in most receivers is fairly stable on the lower frequencies. However, at frequencies above 5 Mc. the stability of many h.f. oscillators leaves much to be desired, when thinking in terms of the stability required from these oscillators when using i.f. carrier insertion. Fig. 4 - A comparison of (A) a 1-Mc. signal modulated by a complex wave, and (B) the same signal with carrier and one sideband removed. In using carrier insertion at the signal frequency from an external oscillator, the procedure is as follows: With the receiver set up in regular a.m. position, first tune the bandspread dial for maximum indication of the S-meter from the signal. Then adjust the frequency of the external oscillator to the approximate frequency of the incoming signal, and increase the amplitude of carrier injection to a point that approximates the amplitude of the s.s.b. signal. When this point is reached, the S-meter will no longer swing with modulation. Carefully adjust the frequency of the external oscillator until the voice sounds natural. Rock the receiver bandspread dial back and forth across the carrier. You will easily be able to tell which sideband is being transmitted. As you leave the carrier, on one side the audio will drop off; as you swing on the other side, the audio will come up. The more selective the receiver, the more pronounced this effect. An s.s.b. signal suffers a certain amount of nonlinear distortion when demodulated by a linear rectifier. The amount of distortion produced is relative to the modulation depth of the injected carrier by the s.s.b. signal. Increasing the carrier injection above the 100 per cent modulation point will reduce the nonlinear distortion in the detector to a negligible amount. Increased carrier also helps swamp out adjacent channel QRM and generally to improve the signal-to-noise figure. 1) Stability of the received signal. 2) S-meter reports may be given on s.s.b. 3) It makes round tables including s.s.b. 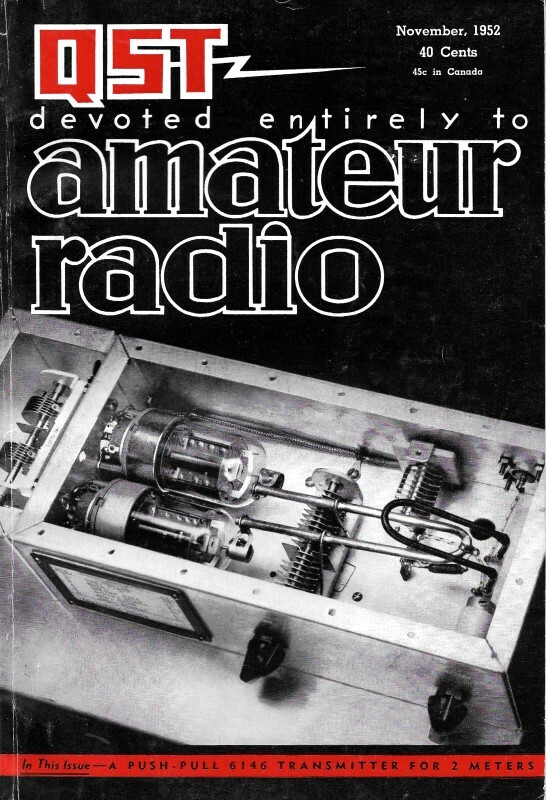 and a.m. stations practical, since the receiver remains in the a.m. position at all times. 4) Oscillators in the s.s.b. exciter may be used to furnish the stable carrier to the receiver, providing consistent "on frequency" operation of the transmitted signal. Point 4 is very important from the standpoint of pleasurable operation and good operating practice of a s.s.b. station. Since the oscillators in the s.s.b. exciter furnish the carrier to the receiver, the transmitted signal is automatically on the same frequency as the received signal. This means that only one oscillator has to be adjusted to get both the receiver and the transmitter on the same frequency. Of course, any large frequency shift would require resetting of the receiver bandspread dial. This method, if universally adopted, would make practical operation of single sideband as simple as operating an a.m. transmitter, by eliminating the extra tuning procedure. With amateur s.s.b. operation still in its infancy, elimination of a tuning operation may not seem of much importance. However, as new s.s.b. stations come on the air and spread out on the bands, the elimination of a tuning operation becomes more important. If all s.s.b. stations involved in a voice-controlled round table were using their exciter VFO for carrier insertion to the receiver, they would remain on the same relative frequency. Using this system, any drift occurring in the local VFO, or drift occurring in a VFO on the other end, is compensated for while listening. It would not be necessary to halt the entire round table QSO every so often and realign on somebody's frequency. Proof of the need for the adoption of this operational method can be obtained by listening to any large s.s.b. round-table QSO on 75 meters. Note the confusion and the lost time caused by off-frequency operation. Then, too, it is rather difficult to impress anyone that single sideband has come of age and can step in the same ring with a.m. after they listen to that sort of operation. There is another advantage to VFO carrier insertion. Those who have used it have found that when they are in QSO using voice-control break-in operation, they can control the QRM situation very nicely. If they hear QRM come in on the low side, they merely move the VFO higher until the QRM disappears. If the QRM comes in on the high side, they move the VFO down until the interference disappears. With the tuning ease afforded by this system, rapid QSY is practical, providing a most effective way to dodge QRM. Construction of signal-frequency carrier generators will be discussed in a subsequent article.